To me, the easiest path to a “to die for” recipe is combining an ultra sweet ingredient with a serious dose of salty savoury. Example? Figs on toast. This makes for a great snack or a beautiful addition to your Sunday brunch spread. It’s the type of spread that takes five minutes to make, but thanks to its sheer beauty, will blow guests away. 1. Toast your bread, then brush generously with your evoo. Sprinkle with salt. 2. Slice your figs and lay them on your toast. 3. Grate lemon zest and sprinkle generously on your figs. 4. 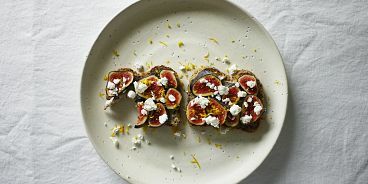 With your fingers, break your goat cheese apart and sprinkle on to figs (you could also spread directly on the toast). 5. Finish with more salt and a drizzle of evoo.